Students say thanks to outstanding teachers through First Community Credit Union's Stars in the Classroom program. 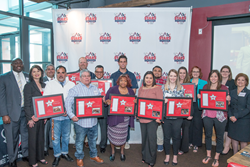 FCCU, the Official Credit Union of the Houston Texans and the personal choice of linebacker Brian Cushing, will accept nominations until Oct. 31st. Ten outstanding teachers in the Greater Houston area will be named one of First Community Credit Union's Stars in the Classroom and will win a visit by a Houston Texans player, two tickets to a Texans game, and other prizes. Students in grades K-12 who are at least five years old can visit texanschecking.com/stars to nominate their favorite teacher with an essay of no more than 500 words. Entries can be submitted through 5:30 p.m. Oct. 31, 2017. “The Stars in the Classroom program exemplifies the work teachers do day in and day out. So many times, teachers do not get the credit or accolades they truly deserve, and this is one way First Community Credit Union shows them just how special and extraordinary they are,” said Nancy Trennel, Senior Vice President of Marketing at FCCU. A visit by a Houston Texans player. A commemorative custom game ball. Two tickets to a Texans home game with sideline passes. A $500 donation to the school district in honor of the teacher. A $200 gift card compliments of Palais Royal. In addition, the nominating student will get a football autographed by Houston Texans linebacker Brian Cushing. This is the seventh year that FCCU has supported Stars in the Classroom. First Community Credit Union began as a credit union for teachers in 1954 and has been an avid supporter of education ever since. Stars in the Classroom was founded in order to honor and say thanks to just some of the many teachers who have a positive impact on their students every day. Employees of FCCU are deeply rooted in many Houston-area school districts and volunteer on various committees in Spring Branch ISD and Alief ISD. For more information about Stars in the Classroom and First Community Credit Union, please visit FCCU.org or texanschecking.com.